Erica and I headed to Creativ Festival here in Toronto on Saturday. We had a great time! Basically Creativ Festival is a big gathering with venders selling supplies (sewing, knitting, scrapbooking, etc), product displays, classes, how-to’s, and seminars. It was pretty fun; I got a lot of sewing (and some knitting) supplies and Erica bought some yarn and knitting patterns. We also saw Kaffe Fassett in the food court area! I got a picture of him, but it was only from behind so I’m not going to share it here. Unfortunately taking pictures was prohibited at the Festival (I probably shouldn’t have taken that picture of Kaffe even from behind), but I did take pictures of my haul to share with you. I got some great stuff, and all for really great prices! I’m not very good at knitting and I only do scarves (hah!) 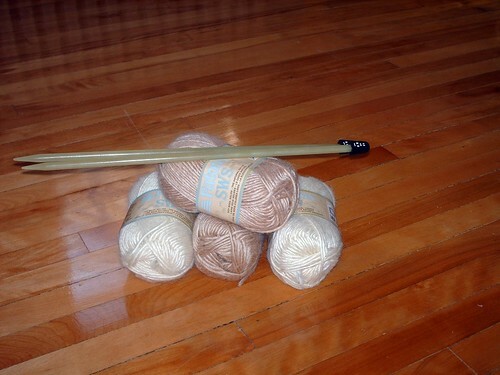 but I picked up some bigger needles and wool. I didn’t realize until after I bought them, but those needles actually grow in the dark, isn’t that funny? I also picked up 4 skeins of wool-cotton soy blend to make myself a winter scarf. The progress on Alex’s scarf (navy and grey stripes) is coming along well, and hoping to be able to start mine soon so that it will be done in time for winter. I picked up some great fabric including two metres of Heather Bailey Painted Mum in cream (so super-cheap, if I had had more cash on me I would have bought more), a 1920s reproduction fat quarter that I thought was pretty, and a “Have a Sheri Berry Holiday” charm pack of 42 squares (2 of each print in the collection). 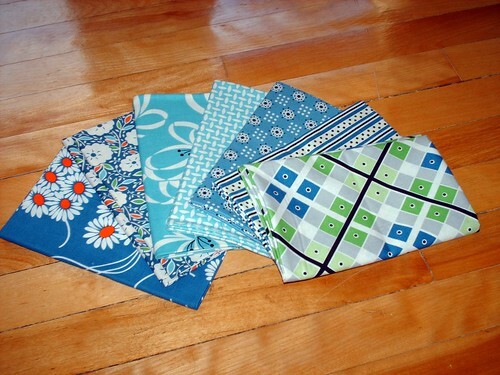 I also got 7 fat quarters from Denyse Schmidt’s Katie Jump Rope collection. 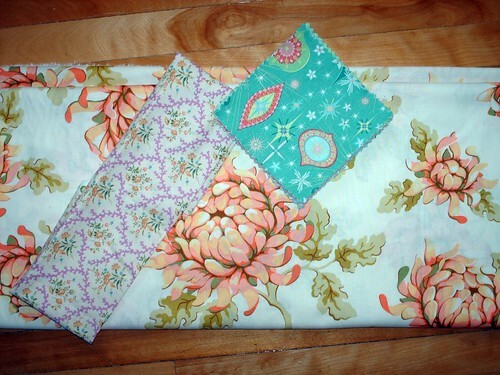 I just love Denyse, she’s so talented and I love every fabric collection she’s ever had. There are many people out there who are in love with Denyse and especially her line Flea Market Fancy (we call ourselves Flea Market Fancy Freaks) and boy, do I have a surprise with the next couple of pictures. 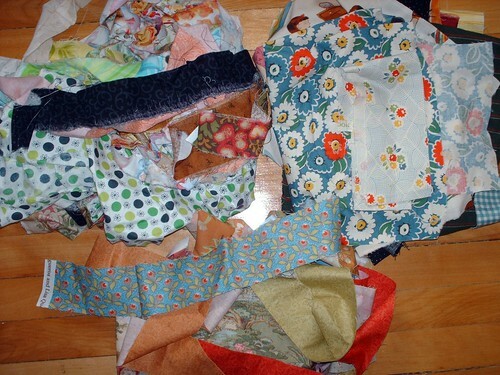 I picked up three scrap bags because I’ve been thinking about making a string quilt. But wait, what’s that you say? It couldn’t be, surely not in a (super-cheap) scrap bag?! Oh yes my friends, that is exactly what you thought it was. A piece of Flea Market Fancy (specifically green daisy dot)! 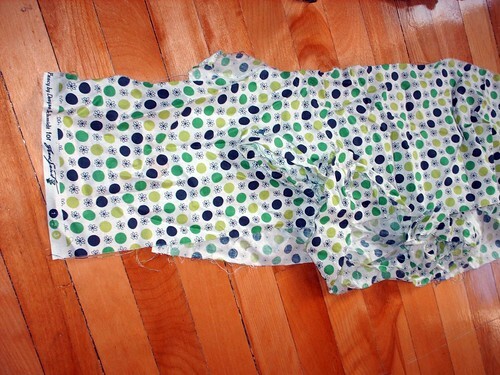 I think it’s about ¼ metre (plus there’s another small scrap) but I haven’t ironed or measured it. I was very excited to spot it although I have no idea what I’ll do with it right now. But that doesn’t matter, because with this fabric, whatever it is will turn out great! I also found some more Free Spirit scraps, some April Cornell, a large piece from Robyn Pandolph’s Captured in Time collection, and about three large cuts of fabric from the Look and Learn collection from American Jane for Moda in my bags. There are probably some other great designer scraps in my bags, but I haven’t had a chance to figure out what all of them are yet although I definitely recognize some. So that is my haul from the Festival, and is, I think, the last bit of fabric buying I’ll be doing for awhile because of school. I’m glad that Erica and I were able take a little break from schoolwork to go because it really was a fun experience. I’m hoping to have the giveaway I mentioned before up by the beginning of next week, but right now I need to get back to working on a paper. I hope everyone’s weekend was wonderful, oh and if anybody has some ideas, I’d like to know what people might be interested in seeing in my Etsy shop once it’s open. I was at the festival too - but didn't see the scrap bags - I definitely would have scooped some up! I didn't see the scrap bags either! Nice find! For some girls it's shoes. For others it's bags or clothes. What a great haul from that festival! For your etsy shop...let's see... 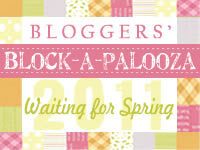 I would like to see lap quilts, maybe treat bags for snacks for humans and animals, bags for glasses (with seasonal and animal themes - I am always looking for new cases for my glasses since I cannot live without them), maybe some small gift bags that people can put jewelry in... and lastly fabric scrapbook embellies. I dunno. That's just the stuff I tend to look for! heh. there it is!!! in all it's glory! super great finds! thanks for sharing your fab find on FMFF! very very pretty prints! im so happy that u found everything u liked! :) AM terribly excited to see what exciting creations will become of them! Great stuff...I'd love to see a string quilt. Sounds like a fun weekend. Great to escape pressures of school once in a while. Looks like you found some fun stuff. Good luck on your Etsy shop. I agree with the earlier post of items to put in your shop....especially the little craft bags with goodies inside. Did you see the tutorial Happy Zombie did recently? Check it out for a cool pattern.